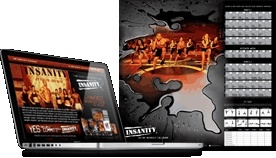 In addition to everything in Shaun T's INSANITY program, this package also includes THREE more extreme workouts—MAX Interval Training, Insane Abs, and the lethal Upper Body Weighted Workout. WHY GET THE EXTRA DVD'S? Perhaps you're truly mad. Or a real masochist. Or maybe you just want the most extreme form of the most extreme workout on the market. Either way, the INSANITY Deluxe package will push you right to the top, and then over it. Whether you've just completed the hardest workout program ever put on DVD and now want more, or if you want to hit the ground running, Shaun T will push you past your limits with these 10 workout discs packed with plyometric drills on top of nonstop intervals. In addition to everything in your INSANITY program, you'll receive 3 more extreme workouts. Upper Body Weighted Workout: Even Shawn T is willing to use weights to get that totally ripped look. INSANITY words for one simple reason: by pushing your body as hard as you can for 60 days, you get astounding results. This workout is not intended for the weak of heart or the beginning athlete, but for those already seasoned by exercise and ready for an extreme challenge. Shawn T's Max Interval Training concept forces you to work as close to your lactic acid threshold as you can get, and then keeps you there. By the time you're done? You're ready drop into a puddle of your own sweat. But give it two months, and you won't even recognize your own face.